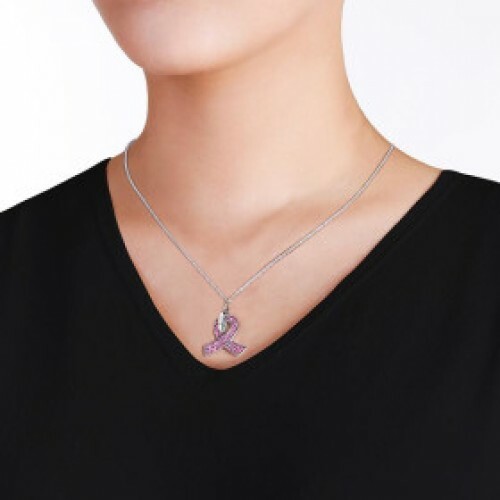 The Giving Back Pink Ribbon Necklace is a gorgeous design that every woman should own. It’s a fantastic way to dress up an outfit, while helping to fight breast cancer by spreading the pink ribbon message. Whether you want to fight breast cancer, know someone going through it, are a survivor, or know someone who is a survivor, this is a wonderful purchase. It looks great and has a lot of meaning behind it. From an elegant chain, there is a pink crystal encrusted ribbon pendant that sparkles brilliantly. The shine that comes off of it is fantastic. And for a final touch, this pink ribbon has been given a tiny word tag that says: Hope. Wear this alone or layer it up with other necklaces for a bolder appearance.